Historically, all-in-one audio components have been looked down upon by serious audiophiles, who typically prefer big-boy, multi-piece component systems. I suppose the category’s lack of respect is due in part to not-so-pleasant flashbacks to ancient “my first stereos,” such as KLH Model 11 suitcase units. But this is 2018. Some audiophiles my age have even (gasp!) downsized their abodes to something more manageable and may no longer have room for a multi-box, multi-tethered “trophy” system in their new digs. If you’re one of these or if you’re just tired of all the clutter, there is hope. The AVM Ovation CS 8.2 combines tubey goodness with a modular design that allows for upgrades, updates, board swaps, and selectable options, so you could even jump off the new-gear-every-year treadmill! You’ll also need fewer cables, and it even plays CDs. In addition to us Old Fogeys, the AVM 8.2 should appeal to millennials, hipsters, tech geeks, start-up super-star coders, and other music lovers shoehorned into urban living spaces, who’d be substituting a great-sounding single piece of electronics for four or five separates. Especially if you know you’ll be moving regularly for a while, it makes sense to have a system that can easily move with you. If you want a complete system in a box (just add loudspeakers, headphones, and some Internet or NAS sources), the AVM CS 8.2 yearns to be your all-in-one, high-performance, multi-year, multi-mode music buddy. If you glance at photographs of the AVM CS 6.2, it looks almost exactly like the CS 8.2. That is because the 8.2 is basically a 6.2 with a tube rather than a solid-state linestage. Anthony H. Cordesman recently reviewed the AVM 6.2 for TAS (Issue 273), and everything that he wrote about the design and technical aspects of that unit holds true for the 8.2. I strongly encourage you to re-read his review as “preface” to this one (although that’s like putting pearls in front of my own swinish prose). He did such a thorough job describing the technical intricacies of the 6.2 that I will focus on those areas where the 8.2 varies from the 6.2. The difference between the 6.2’s and the 8.2’s linestage comes down to the AVM’s use of proprietary 803T tubes instead of solid-state devices. This change also required a different power supply for the linestage section. 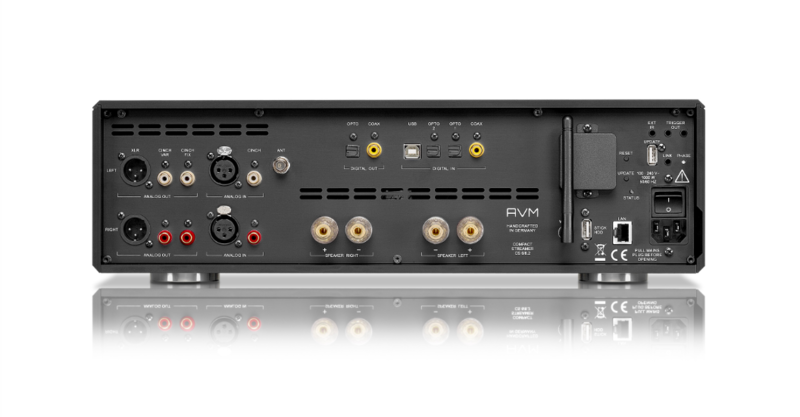 Because AVM chose to add tubes to the preamp rather than to the power amplifier section, the power output and overall specifications of the two units are the same. The only real user-noticeable operational difference between the 6.2 and the 8.2 is that while the 6.2 wakes up instantly from pause/sleep/off modes, the 8.2 requires a warm-up period for the 803T tubes, during which the output is muted. Aside from the valve front end, the 8.2 is the identical twin of the 6.2. If the 8.2 didn’t have a glass section on its top plate (to showcase those glowing tubes), it would be impossible to tell the two units apart. Along with the front end, the only other difference between the 6.2 and the 8.2 is price: The 6.2’s MSRP is $10,995, while the CS 8.2’s is $12,995. Once the CS 8.2 is physically installed you can make adjustments to fine-tune its output, such as changing the input levels of each source so they are approximately the same, adjusting the tone controls (you can save settings for each input), and tweaking channel balance. You also have two different digital filter options (steep and smooth), and the AVM allows for upsampling to 384kHz from lower-resolution PCM sources. As with level and tone adjustments, the CS 8.2 will store and recall filter and upsampling settings for each individual input. One feature that most high-performance preamps or receivers lack is a loudness control, which is a bass boost used when playing music softly. Many audiophiles don’t care for the loudness control because that bass boost is not adjustable—one setting is all you usually get. But AVM had a better idea: The 8.2 loudness control has nine different settings to choose from. AVM supplies three distinct ways to control the 8.2: via the front panel using its two large knobs and five control buttons, or via the iOS/Android app, or via AVM’s optional universal remote control ($695). While the remote is quite serviceable, unless you don’t own and never intend to buy a smartphone/iPad I would strongly recommend using the app for remote duties. Especially if you have an iPad or 64-bit Android pad, the AVM app is a pleasure to use.